Despite the extreme volatility of gold prices, investors continued to dump more money into gold throughout 2008. The latest quarterly gold report shows us some interesting figures and clearly displays that despite the volatility, many investors feel more comfortable holding gold then various other investments. Tim Iacono from The Mess That Greenspan Made takes a closer look at the report and tries to shed some light on the precious metal's up and down performance. The World Gold Council released their quarterly Gold Investment Digest yesterday and it contained a number of very good charts including the one below that recounts the many financial market crises that drove investors away from other financial assets and into gold. They noted that the rising price of gold was quite impressive given all the carnage that occurred elsewhere, most equity markets and many other commodities tumbling 40-50 percent or more for the year as the price of gold posted its eighth annual gain, up four percent. Holdings by the ten gold ETFs around the world climbed to new record highs with another 96 tonnes purchased during the fourth quarter following a whopping 145 tonne addition in the third quarter. As shown below, the total amount of gold in the ETFs rose to 1190 tonnes by year-end, worth more than $33 billion. Note that the SPDR Gold Shares ETF (NYSEArca:GLD) just added another 13 tonnes yesterday after a three tonne increase on Monday bringing its holdings to 819 tonnes, by far the largest of the bunch. Elsewhere in the report, mine production was said to be stable, up just two percent overall from a year ago with a number of countries, notably South Africa, experiencing sharp declines. China passed South Africa last year as the world's biggest gold producer. De-hedging continued but will have a much smaller impact in the future as the total outstanding hedge book now stands at just 526 tonnes. As shown to the right, during the four quarters ending in Q3-2008, miners de-hedged a total of 368 tonnes. Note that official central bank gold sales dropped sharply, ending up considerably below the 500 tonnes allowed during the fourth year of the Washington Agreement on Gold. Jewellery demand rose during the third quarter (the most recent quarter for which data is available) and was up modestly on a year-over-year basis, however, the fourth quarter will likely show a big decline due to the worsening worsening economic conditions around the world. 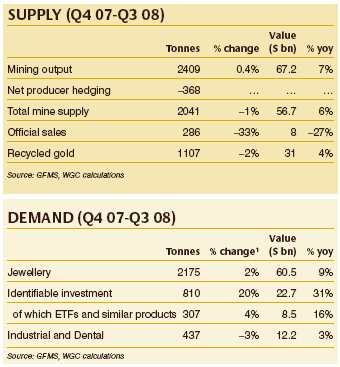 As should be clear in the table, it is the increase in investment demand, not jewellery demand or industrial uses, that supported the gold price in 2008 and this is likely to continue this year.